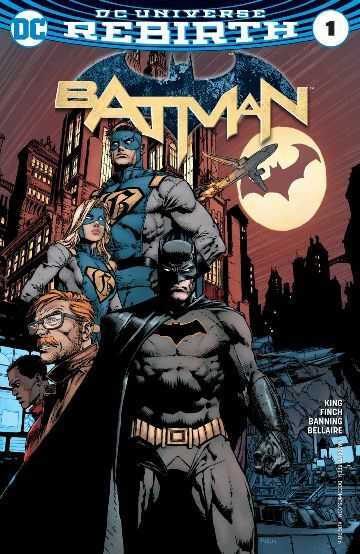 I have anxiously been waiting for this book since Tom King’s announcement as the head writer for Batman. King’s work on Omega Men, Grayson, and Vision were all truly brilliant, and his first issue on Batman was one hell of a ride. 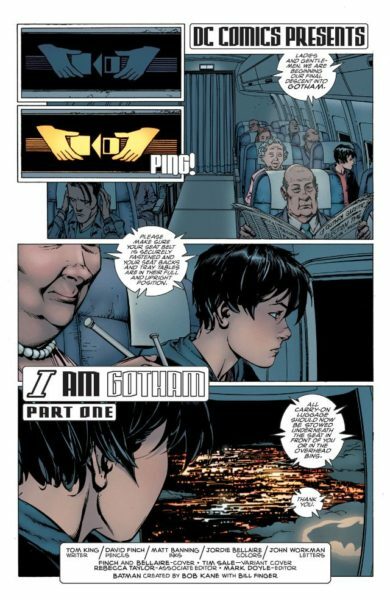 The issue starts with a young boy looking out a window of an 747 airplane as it approaches it’s descent into Gotham. Meanwhile, Batman and Commissioner Gordon are having a rooftop meeting, and that’s when the issue picks up. I don’t want to spoil anything for you, but this is seriously one of my favorite Batman issues in a while; and, that’s coming from an unabashedly biased Scott Snyder fan. You seriously need to make sure you pick this up while you are at the LCS today or tomorrow, because I’m predicting this to be a huge series, and another long run on the character. It’s wonderful seeing David Finch back on Batman, this is where his best work shines. Finch did a fantastic job capturing the emotions between both Batman and Alfred. Besides the intimacy that Finch captured, the action scenes in this book were fantastic. There were two splash pages focusing on the new design on the suit, and they were absolutely stunning. Jordie Bellaire and David Finch seriously make on of the best artistic teams in comics. It’s hard to believe that this is the same David Finch who worked on Detective Comics and Wonder Woman (New 52). His work on those books weren’t bad, they were actually beautiful, but the art in this book is just so much more different than what we have seen form him in the past. I think we all expected this book to start with a bang, but I don’t think it would be as emotional as it was. It wasn’t as devastating as DC Rebirth #1, but man, this issue was still rough. There was a particularly emotional moment when Batman asked Alfred if his parents would have been proud of him. I didn’t think this issue would be THAT much of a tug on my heartstrings, but damn if it was. Besides the emotional aspect to this book, King also introduces two new characters (It’s not a spoiler, they are on the cover) and its uncertain if they are heroes, vigilantes, or villains. Either way, these new characters definitely have a certain vibe to them that makes it feel like they will be a serious threat to our beloved caped crusader. If you are a Batman fan, Tom King fan, or just looking for a new series to get into, Batman #1 is a fantastic jumping on point. This will be a wonderful issue to pick up if you are a lifelong Batman enthusiast, or just jumping into the world of comics. Do yourself a favor and pick this book up. And, if you are in the middle Tennessee area, go pick this up from our friend Dave at The Game Cave in Hendersonville, and tell him 4LN sent you! I actually struggled with figuring out what music would fit this book best. Then it hit me, “I’m Not Part of Me” by Cloud Nothings really fit this book. It’s just a fun sound that has some noise rock/distortion vibes to it. So it’s easy reading music.